Just in case you haven't read the "The Start" of this blogsite, in the interests of fair and free journalism everywhere, I again declare my allegiance to Pentel. The P1035 Sharp Kerry mechanical pencil is perhaps the premier pencil in the Pentel range. It is a rather unique two piece design where there is a cap (much like with a fountain pen) that fits onto the front end of the pencil when not in use and onto the top end of the pencil when in use, when it becomes part of the pencil and its mechanism. When clipped on to the top end the push button top on the cap then pushes on to the button on top of the body to activate the ratchet lead mechanism. This cap system is an intriguing design and it introduces a deliberate extra step into the process of getting ready to use the pencil. Thats great if you are one who likes the steps and feeling of "getting prepared". I must mention that sometimes my pencil has an annoying little rattle when first used, but it seems to go away fairly quickly, as if it was temperature related. The Sharp Kerry comes in a variety of colours and lead sizes. Mine is 0.5mm lead, and a very attractive blue colour. There is a milky sort of opalescent lustre to the blue. The cap is metal whereas the blue body sections are plastic. There are flow lines in the plastic which some might consider decoration, but really I just see a flaw. The chrome metal trims complete the picture but the front tip is matt which I find a bit questionable. I think it might look better with all trims being chrome. The pocket clip is the standard Pentel metal clip - functional but not spring loaded. There is a small eraser under the cap button, and the leads are refilled under the body button. Putting the body button back on doesn't usually activate the lead mechanism! The long metal lead sleeve means this pencil is usable for draughting work. It's not retractable, but the cap eliminates the need for that anyway. At 9mm diameter the grip section is a little smaller than my preference, and this pencil is defintely not top heavy. "Kerry, since 1971" is marked on the cap, along with "Pentel, 0.5, P1035, Japan". That's great, I always like the full details. The Pentel website calls this the Sharp Kerry, which did produce some comments about Pentel expressing their political preferences, and would they be releasing the Dull Bush model. 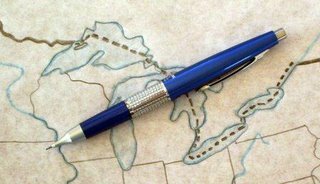 But wherever you are on the political spectrum, there's no denying that the Sharp Kerry is another mechanical pencil masterpiece from Pentel. Not So Good Points - Can't think of anything significant! Dimensions - Length124mm capped, 132mm in writing mode. Diameter - 11mm at widest part, 9mm at grip section. Balance point 65mm up from tip. Here is a negative with the pencil. After a while, the cap starts to loosen up a bit, and advancing the lead sometimes causes the cap to disconnect. These are the greatest for left-handed people. The lead feed is more precise and long-wearing than with other mech pencils, so the lead breaks off a lot less often. I consider this a pencil to last for years and years - in fact, I have. Wow, I hadn't ever thought of left-handers having different mechanical pencil requirements. Can you tell me a bit more about this? Great site. I've collected mechanical pencils on and off for a while. Unfortunately I had a habit of losing them, so my collection had shrunk until recently, when I began building it up again. I'm an engineer so I need good pencils for school and work. I have two (soon three) 0.5mm Sharp Kerry pencils in red, blue, and green. I love the art deco style and they are very comfortable to write with. These are my favorite pencils at the moment. A close second is my Sensa Crystal Silver 0.5mm pencil with a twist ratchet mechanism. I know you are opposed to rubber grips, but Sensa's grips are about the best you can get. They feel great, clean easily, and don't look cheap. I also got a Pental Graphgear 1000 0.5mm which my fiancée liked so much she took it from me. It has a unique combination clip/retractable tip mechanism. I was not a huge fan of this one as the body was too thin for my liking. From my old collection, I have a Pentel Graph 1000 (0.3mm) which I don't use too much because the lead breaks too easily. Also there are a couple of economy Staedtler and Sanford pencils. I used to have a larger collection of drafting pencils from Koh-I-Noor, Staetdler, Pentel, and Berol (?). These had metallic grips (uncomfortable to me) and non-retractable tips (which get bent all too easily), and eventually they got lost or too bent out of shape to use. I think I'm going to stop for a while ... I may pick up the Pentel Classic Deluxe and the Rotring Initial at some point. You've complained about not having brands available in New Zealand - have you tried eBay? There's a pretty wide selection and many sellers are willing to ship overseas. Great blog! I've been searching for the pencil equivalent to Cross's Ion pen, and !voila! here's your information. Many thanks! Great review! I've been meaning to try one of these pencils for a couple years. I think I am going to pick one of these up. Thanks for the info. One thing I would like to see though is the size/quality of the eraser. I use mostly pencil at work and erase often, so that is important. The only thing you mention is that the eraser is small. I hope its not too tiny, because that make me reconsider the purchase. Well as keen as I am to recommend the Sharp Kerry, the eraser is small. It's the Pentel Z3-1 eraser to be specific, which is roughly 4mm diameter x 8mm usable length. Thats a little bit bigger than 1/8th x 1/4 inches. So they don't get much smaller. I think it's great that there is a site with mechanical pencil reviews. I wanted to make a comment on one thing you said. "The chrome metal trims complete the picture but the front tip is matt which I find a bit questionable. I think it might look better with all trims being chrome." Actually I prefer a matte tip on my pencils because the reflections from bright sun or overhead lights on chrome is a bit distracting to me right on the tip of the pencil. It's always amazing to see what the web has made possible! I enjoyed reading through the site very much, and especially finding a review of the Pentel Kerry. I've been using Kerry's for about fifteen years. They never go bad, but after a few years in my pants pocket with keys, etc., they look a bit trashy. Of course, this is the only pencil I've found that can even survive life in a pants pocket! I live in the US, and none of the samples I've bought have ever shown the model. A stationer identified it as a Kerry to me, but the pencil itself says only Pentel 5, and Japan. I've used every color and currently have a black and a green. I'm also a sentimental user of the P205, but I never carry one with me. Too hazardous. I have a few others that also live in a desk, but a unique favorite I've had for twenty years is the Niji Grip 500. The one I own is the only one I've ever seen. If your Kerry's cap happens to come off while advancing the lead, it's probably because it was disassembled/reassembled wrong. The two litte chrome rings on the midsection of the pencil body can go on either way, but only keep it together TIGHTLY one way. I scanned but did not see any comments on left-handed use. Turns out, the pushers' action is brutal on ball points and roller balls. See, pushing the tip across the compressed wood chips called paper is very abrasive to the edge of the cup that holds the ball/roller ball. The edge wears quickly and begins to leak and blob the page - or it totally jams. Pulling the ball point across the page does nothing of this kind - in fact, it burnishes the cup point. I'm a pusher, so I just use pencils. The comment about the precision of the Kerry's tip is right on. Loose tips are also problematic for us pushers; wobbliness is more pronounced, and the lead breaks more easily. So, the tight, long-lived tip of the Kerry is valuable. I've a friend who has one that's 15 years in daily use. He's a puller though. If your reviews include comments about tip precision, I'd sure find them helpful. And thanks for the many thoughtful reviews. I'm gonna go out and get me a Lamy 2000. Ken - thanks for your comments. I think I now get the left-handed bit. I'll try and make some mention about tip precision in future reviews. I guess both aspects of tip precision are important in this context - (1) the rigidity of the tip itself in the body, and (2) the amount of clearance or play of the lead inside the tip/sleeve. I don't know how I can be objective about measuring these but I guess any informed but subjective comment is better than nothing. I'm trying to find a Kerry pencil with a green barrel. Do you happen to know where I can get one? I just realized that I picked up the Kerry in my briefcase over 20 years ago, and it still looks great and works well. Did they ever make a matching pen? What a splendid site! I have a great love of writing and drawing instruments and have been using the same Sharp Kerry since 1990. The Sharp Kerry has started to drop the leads rather than just advancing them. This is a problem for me. I have taken it to pieces and fiddled with it and put it back together, but it still does this. Do you happen to know if there is a fix for this problem? Bigstupid - thanks for the comment, sorry I don't know about a pen version. Thisvanessa - 2 possibilities off the top of my head. I have had this happen when you get "undersized" leads. Staedtler brand seem a little prone to this. The other possibility is the lead retaining ring in the tip has worn or fallen out, or some other general mechanism malfunction. Pentel seem to be rather good about repairing/replacing faulty items, even really old ones, so you might give them a try. But check the lead diameter angle first - try some Pentel leads. In response to Dennis, I too have a Niji Grip 500 .5mm pencil. It is however, from my mom when she was in college and is a little worse for the wear. The sine is gone from the eraser cap and the grip dried and cracked years ago. I now have some black duct tape replacing the grip. Does anyone know where one of these pencils can be purchased? Hi Francis - I wouldn't worry too much about it. Clearly a lot of people have had Kerry's for a long time without problems, and if you do have a problem, then from comments about Pentel on this blog I'm sure they will give you a new one even thought yours is years old. Thanks so much for the name of this pencil. I've been using a Kerry (red one) for the past 18 years. It's the only pencil that feels comfortable to me. Mine just broke yesterday and I was in search of a new one. Like some others here I didn't know the name of the pencil since it just says Pentel 5 on it. Thanks to your blog I learned the name and just went on-line to Pentel and ordered a new one. Many thanks!! I bought a Kerry purely on the back of this review and I must say I really like it. Nice size, weight, look and feel. And, nost importantly, nice to write with! Just out of interest, does anybody know the history to why most Pentel Kerrys say '5' on them? Mine is Black and says 'Kerry Since 1971' instead of '5'. Any idea why this variation exists? Is this text variation available on other colours? I doubt it's a limited run but you never know. Thanks for the reviews and interesting to read other people's comments, too. Great site! OK Jimbo, I'll await the results of "Face Off" : Niji Grip 500 versus Pentel Sharp Kerry. Jimbo - great to hear of your enthusiasm for the Sharp Kerry, its a great pencil. Crikey, as they say, 500 MP's - whilst we are in the same MP ball park, I've only got about 1/100th of the wooden pencils. This pencil was amazing and I remember it being my favorite pencil back from 2001-2003. I don't remember it being called the Sharp Kerry though. Was there a name it went by back then? Thanks! I think it has always been Sharp Kerry or just plain Kerry, but its not usually on the pencil or packaging, so many are unaware it has a name. Just a small FYI: The (supposed) big 5 printed on the cap is not a 5at all but an "S" for Sharp whether it is on the fully printed Kerry's or the Ones that Just have the "S" and Made in Japan like mine. BTW - Dave - Love the blog and the reviews and the pictures and tests and all that jazz. Also, I love my Kerry (Blue, 0.5mm) even though I only knew it was called that for the last few months and I've had it for likie 8 years. I used to see other enginerering nerds (RPI Mid-80's) using them and wanted one too but too poor to buy one (and not beers instead) and didn't even know the bookstore sold them anyway. But I got to use one for couple years then anyway because I found in the grass on campus without the cap and really loved using it that way but again still always wanted one with a cap. But at some point, in an easy come easy go even stephen way, I lost it. Then I found them still for sale in the Campus Booksaore when I was back for a visit in 2000 for a wedding. Now I protect it with my life, even if I can still buy them just about anywhere now. I do wish there were some even more upscale versions of the Kerry that had not just the cap in metal but also the two barrel sections and maybe all the plated parts in the matte finish and maybe even an model that was not painted but came in some sort of true metallic finish like anodized or some sort of polished or brushed metal or, god forbid, solid precuious meatls or at least high quality plates. Oh, one other thing (as I think Dave metioned), the Kerry could use a better pocker clip, preferably a solid spring loaded one (rather than a crimped on stamped spring steel one) that won't become useless the first time it gets bent out of shape by some person that doesn't know how to be good to a fine writing instrument. Personally, I really love the spring loaded pocket clips that LAMY uses on many of its better products like the 2000 Pencil Dave you reviewed. I have a nice Brushed Stainless Tri-Pen/Pencil that has almost the exact same pocket clip but it is va very differnt instrument otherwise and yet thinner with 2 pens and a 0.5mm pencil. I also really like Waterman's spring loaded clips but they do have a lot of side to side play but at least when you pay that for a pen or pencil, the pocket clip should be just as well engineered as all the rest of it. Okay, I'll stop rambling now! jimbo - you must take pictures and load up your collection!! is it thin lead or a mixture of thick, thin and leadholders? gregdavid - having been a Pentel enthusiast for well over 25yrs (i'm 35.....), I can say with authority, that it is a "5" on the barrel, not a capital "S". This refers to the size of the lead used in the pencil. Germ - It took a second, but I know you (if know is the right word). First, I thought you might be Gunther of Gunter's Pencil Blog (the Germ being short for German and thus a nationality based pseudonym and Gunther's blog being quite uber-kick arse if you need photos). Alos, in your little icon piture you look like a Gunther (whatever that means). But then I clicked on that icon and got to your blog page and found that you were the guy that I bought a Blue Parker Vector from about a month ago. My e-Bay ID is gkibitz and I've just taken up much more active mechanical pencil collecting (which has always been a more passive affair for me and I only have in the 10's, not 100's or 1000's, but I do hope to correct that, financing being the #1 issue). As to the 5 vs. S issue, do you actually have an old style labeled** 0.7 Kerry with a big 7 on it? Such data would surely clinch this for me because as much as I'd like to believe you, I've learned (in my 43 years - LOL - you played the age card first), to always be skeptical until I have absolute proof otherwise. Faith and trust can be useful, but they usually play no role in my science based reality, as Faith and Trust have tended to screw me just as often as not. FYI: What lead me astray to the S idea was Pentel Anerica's very own online product catalog that still uses images of the old style labeling (which I didn't even know yet was old old style, just alternative). Like I said, I'm just making sense of the Sharp moniker and when I found that the Sharp Sliding Sleeve Pencil PS535 had the same big symbol on it, I jumped to the S=Sharp conclusion. But that model is also a 0.5 and thus your assertion now works too. Germ - I found a picture of a 0.3 Pentel in your collection on with a big 3 on it so I am now 99.9% convinced. Now to find an image of one with a 7, preferably a Kerry. Well I've got an old Pentel or two and its definitely a 5 on them not an S. I've always assumed it was 5 for the lead size as this was when 0.5mm was still a newish lead size. I always kinda thought it was a stylized S (yes with a sharp angled upper left corner that was surely more bespeaking of a 5 yet I never ever even considered that it might be a 5). Short on definitive evidence to the contrary, and with my desire for cognitive consonance, as opposed to dissonance, being quite stong (who's isn't? ), I could not accept that it was a 5, so I found, at least temporarily, a really good reason for it to be an S (viz. = Sharp). Of course, as I said, due to the odd lableled one I have, and how I got it, I had no idea until the last few months that the model name was a Kerry or that it was part of the Sharp line. It was just that super cool, expertly engineered (designed & manufactured), 2 piece Pentel I had with odd labeling. Plus, even the 2 piece plastic retail case it came in when I bought it in ~2000 (to replace the free one I found and then lost again in the mid 80's) only said Pentel and nothing more. The other point to always keep in mind is that in Japan, mechanical pencils are called "Sharps". So, in English we might say "I collect mechanical pencils" but in Japan they would say "I collect sharps". Dave: Here is what has me very confused. Pentel actually has the Word Sharp™ printed right on their packaging (on P205 2 packs for instance) in very big letters and with the little trademark symbol right after it. (See e-Bay item 140258921273). Plus Pentel use the word Sharp w/ no little tm) right in the names of many of their pencils in their Pentel America online product catalog. So even if the word sharp is synnonomous with the word pencil in Japan, it still has the quality that is is more like Kleenex being synonomous with tissue in the US (where a proprietary branding name actually has become the goto word). I pretty sure that in the US you could never trademark the word Pencil (though I;m sure some have tried) and I would think that the Japanese business rules would be about the same. But maybe I'm wrong abou that. Oh, and just to make things more confusing and complicated, let us not forget that Sharp is the company name of a very popular and decent line of electronics, I believe also from Japan (but doubtfully made there anynore as they are usually sold at the loower end of the market, but not the lowest). Yes indeed. Sharp started out making mechanical pencils and popularised them in Japan, hence the word sharp being synonomus with mechanical pencil in Japan. Sorry gregdavid, I'm afraid I'm confused about what's confusing you. I assume you are right about the Sharp - Kleenex analogy. "Sharp" is the model name of the P205, so its just like the word Flexfit or Clarius or Classic is to their other models. It appears Pentel have trademarked that name in the US. They also use the word sharp as part of the model names of some of their other models, e.g. Sliding Sleeve Sharp, etc. I don't see the confusion? I'm not that confused (but was). After you said Sharp was generic for pencil in Japan, it made me start questioning whether Pentel was using Sharp as a synonym for pencil, or if it really was a sub-line trade name. When I saw that TM, then I had my answer and you have confimed that. No worries my friend. Confusion makes the world go round. Look forward to more discussion in the future. I've been using Kerrys for 15 years or so. But part of the great appeal to me was the design. In the past 2 years, Pentel has started replacing that excellent S on the cap with the word "Kerry" in a really awful typeface, totally inappropriate to the retro-futuristic design of the pen. So what I need to find is some OLD kerrys, manufactured before the logo re-design. Any thoughts on where such things might be found? Jet Pens has a rare Olive Green .5mm Kerry in stock now just picked one up. My original pencils simply said "Pentel 5" on them. The addition of "Sharp Kerry since 1971" always puzzled me. "We heard from our Japanese contact about the significance of the name: Sharp Kerry. 1. The “Sharp” part of the name comes from the Japanese “Sharp Electronics Company”. Mr. Tokuji Hayakawa was the owner of the company. One of his first inventions was a mechanical pencil named the Ever-Sharp. For more information about the Sharp Electronics Company, follow this link: http://en.wikipedia.org/wiki/Sharp_Electronics. 2. The “Kerry” part of the name comes from the designer of the Sharp Kerry pencil. He thought about an image of a black cow in the southwestern county of Kerry, Ireland. The first Sharp Kerry color was black. Then, he added the cross-hatched metal part in the middle of the body of the pencil. The two names were combined to form the name: Sharp Kerry." So who knew one of the best mechnical pencils in the world was named after a mechnical pen creator and an Irish cow? What a marvelously interesting inspiration for the pencil. We mostly knew about the Sharp part (more or less, see above), but I for one had no clue about the Cow! I find it odd that Pentel does not print the word Sharp on any others of its Sharp line of Pencils, like the 200 or 300 series. It only appears on the packaging and in the catalogs. Of course, its even odder that they never put the word Kerry on the Kerry's (or the packaging) until much later. But it could have been that the lone big stylized 5 or 7 just looked so much cooler and the original designer didn't want to muck it up. But, after all the confusion, I guess they had to change and now new lableing, though more accurate and less cryptic, is not anywhere near as asthetically pleasing (IMHO, that is). Up here in Maine, where I live, we have Belted Galloway Dairy Cows. They are mostly white with a black band around the middle (like a reverse Oreo), the opposite of a Black Kerry. So if Pentel ever makes a white Kerry with Blackened Chrome trim, it would have to be called a Belted Galloway instead. I feel complelled to follow up on the cow reference. I have seen a herd of Belted Galloways way out in the back blocks of the wop-wops here in kiwiland, which is very unusual and always impresses my dairy farming relatives. Belted Galloways are very rare down here. $85.50 US for those, who like me, don't deal with the Yen very much. Also, Belted Galloways aren't exactly common in the states either, I just happen to live right near a place that specializes in them. But I can say with authority that we most defintely don't have any "wop-wops." Gotta love that Kiwi (and Aussie) lingo! Of course, being so near these cows, I may just be in the wop-wops myself. Hi Dave. Do you have the .5mm Kerry or the .7mm Kerry? I was on the Pentel website, and the blue color scheme for the .5 and .7 are different, so I was wondering which version you had. 1. Does anyone know where to get an orange Kerry? I had one a long time ago but lost it. 2. Are Kerrys still ever made that say "5" ("S") on them instead of "Kerry"? They used to be like that. Sorry -- I was reading a bit too fast and missed the .5mm lead part. Just got mine. A red 0.5. Seems like just the ticket to compliment my Sheaffer fountain pen! This is my favorite pencil. I had a girlfriend buy me a pink one once as gift. She has since moved on, but the pencil is still with me. Hi Dave. I have lost the crome plated eraser cap off a .7mm Kerry. I will be trying to contact PENTEL and maybe EBAY to see if I can get a replacemet.... hoping the cap might show up later on however. Are there other good places to find a replacement like this ? KMD - haven't checked anywhere, but I think Pentel will be your best bet as caps aren't usually sold as replacement parts. The comments on lefties interested me, as I have had a lot of lead snaps with my Faber Castell (0.7mm). Yes, I'm a southpaw. Had it for a day and a half, and can already say that I love it. No lead breaks so far. Just the coolest. Awesome pencil. Just found a blue Kerry (0.5mm) at the local Office Depot for 16 USD. Great pencil. The design with the cap kind of reminds me of the original bullet Space Pen from Fisher. Once closed, it fits in the pocket nicely. Re: the Kerry and the Space Pen. I was with a friend a few weeks back who introduced me to the Space Pen (he's had his for many years). I immediately thought, 'Wow. This is a really cool pen.' It kind of grabbed me the same way the Kerry pencil did. Of course I couldn't resist showing him the Kerry. His response was the same, and he wrote down the details of the pencil. Maybe Fisher and Pentel should be talking! is the kerry mechanism good? Excellent. See Dave's review of it and readers' comments. I had one a long time ago, and just got another one. No regrets. I have loved using this pencil for years. I always thought the "flow lines" in the casing due to the poured lacquer finish, and it makes the grips on the finger more pleasing and efficient. The flow lines also help with creative thinking as it breaks the monotony of otherwise even coloured pencils. I wrote my whole Ph.D. with this pencil and I still have it to this day, 7 years later. It's the best and most comfortable pencil I have ever used. i was given a blue p1035 by a friend. accustomed to the heft and balance of a pg5 and p205, i find the 1035 to be obnoxiously topheavy and clumsy. for a comparison, a p205 weighs 9.0g and a pg5 weighs 9.5g. this sucker weighs in at 21.0g. the cap is a nice feature, it actually makes the pencil pocketable, though with my drawing and drafting background, i find the short ferrule and long clip to be obstacles. i suppose i'm just not in the market for this type of pencil. despite what i look for in a pencil, it certainly seems like a decent tool. I am glad that Pentel is still making this wonderful pencil. I recently lost the (Black) one that my father gave me when I enrolled in college in 1975 and I feel terrible about having lost it. I had used that pencil every day for 34 years. It is nice to know that I can purchase another, but it will never be the one that Dad gave me. I've had my "Kerry" since before 1985. Pentel did make an Excalibur Rollerball with the same matching chrome on the barrel - a set. I had the rollerball for several years until it disappeared one day. I've been searching on ebay for several years. If there is anyone out there with one, a picture would be welcome! 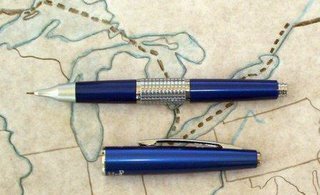 tkc43: would the last pen on the right be the picture you are looking for?? I am an extremely prolific mathematics major and enthusiast. I also know a thing or two about the value of quality writing instruments. I also collect. I am a pentel enthusiast. I like the pentel classic 7mm, but have stretched the plastic rears out of several of them over thousands of pages writing/erasing to the point where the eraser is not so useful. I usually use separate staedler or pentel erasers in my left hand so this is a feat. As for the Kerry! Folks, this is the finest mechanical pencil that I can find for practical heavy use. My wife uses a mont blanc pencil. The kerry trumps that in all respects in my opinion. I just ordered my second 7mm kerry only this time in blue for about $15 at amazon. I know of two drawbacks to this otherwise dreamy pencil. First, it uses the shorter z-31 erasers instead of the z-21 in other pencils. No biggie except that you have to order them because they are hard to find in common stores. Lastly, and this is where I would like to find a pentel dealer. I have managed to wear down the aluminum ring that holds the pencil cap closed on my first pencil. If I could get another of these tiny rings, my first kerry would be as good as new as the inner workings are built to last for years (alot of metal and even what looks like brass inside the pencilwhere others use plastic). I know writing instruments, and I just can not find a more intelligent design that the kerry, so for the money I would buy the kerry all day long. If pentel sold replacement rings I think these pencils would last forever. In any case, I dont think any other pencil of this caliber on the market is more durable than this relatively metal laden sharp kerry. If they ever stopped making them it would break my heart. Hi - I would send your pencil into Pentel, and I am sure it will fix the worn ring issue. Pentel is fantastic about customer service in my experience. I've had mine since sometime before 1986. Mine doesn't say Kerry, it is just Pentel over a stylized 5 on the cap, with Japan on the back. Mine still operates beautifully. It is advertised as an automatic pencil, is this just another word for mechanical pencil? Or does this mean that it advances the lead without clicking? i hope this isn't to novice of a question, but im just looking for a little bit of clarification. Anonymous - that is a very good question. I believe some pencil companies and retailers us the term automatic in a very confusing way. They seem to use "automatic pencil" as some sort of alternative for "mechanical pencil", and thus create confusion with those mechanical pencils that have an automatic lead advance mechanism. So, the Sharp Kerry does not have an automatic lead advance mechanism, you have to click the top button to get more lead. Calling it an automatic pencil is misleading, well it is in my book anyway. Thanx for your fast response man, i really appreciate it. I am completely enamored by your site my friend. I picked up a Kerry today and i love it. I think that your site has sparked something inside me that is going to make me start collecting. I've been surfing the net and ebay for prospects. I believe that this Kerry was a good starting point as i feel it is a must have. Do you have any other suggestions on must haves to fuel my collecting? im pretty much open to any price range and suggestion. I write all day in college and am an avid artist/drawer/doodler. Yes the Kerry is a good start. Check out the Top 5 and Top 10 tabs up beneath the blog header for some more suggestions. Good luck with the collection. A simple question, what is the difference between an automatic lead advance mechanism vs just the push to advance mechanism? On this blog, when I say automatic lead advance mechanism I mean the lead self advances all by itself as it wears down while you write. You don't have to push or click anything. Are Automatic lead advance pencils more prone to failure/problem as compare to self push/click ones? I can't really say, but I generally find automatic mechanisms disappointing and dont usually use them. I just received my blue .7mm Kerry in the mail. My first good pencil( I have a 20 year old Cross in .9mm, but too skinny to use anymore, aging hands and all). I have a couple Pentels, P207, P209, Energizer, Quicker Clicker, but this is my first expensive (it's all relative of course)Pentel pencil. What a difference in appearance. Although, it is a little smaller than I expected. Nevertheless, what a great looking pencil, and writes great too. Thanks for your review, it strongly influenced my purchase decision. Just an update to my thoughts on my new Kerry. It is very quiet when writing with it. The lead noise on the paper is almost non existant. I did a quick comparison with my P207 and my Energize and find the Kerry to be silent in comparison. Whereas the other two make a little bit of scraping type noise as you write. Even tried changing the leads so they all came from the Kerry, yet still the same result. Kind of strange, huh? I enjoy this pencil more each time I use it. I just ordered a green Kerry online after not having any luck finding one in the local stores. I already have a P207, but want something with 0.5mm to replace my cumbrous Dr Grip (which seems to be prone to lead breaks). I'm hoping the Kerry with hi-polymer lead combo will help reduce lead breaks. I don't know where you live, but here in the States they're readily available and stocked at Office Depot branches retailing for $16.99 + tax. I happened to find one at an office depot that I wasn't aware of. I get office depot and office max mixed up, and there are mostly office max stores near me. I found a blue one for $16 like you said, so I guess I'll have two of them. I wasn't sure what to expect from this thing, but after doing some test writing I can safely say that this is the best mechanical pencil I've ever used. Does anyone know what kind of lead they stock them with? I would assume Pentel load their pencils with Pentel Super Hi-Polymer / Ain leads in grade HB. For some reason, Office Depot only stocks the 0.5mm blue version in their stores. So, if anyone wants any other color in any other line thickness, they're out of luck. Fortunately for me, I think the Kerry looks nicest in blue and I don't use anything except 0.5mm lead for writing. However, I do wish that Pentel would make it in brown like they did long ago. I really like that color too. I'm sure the Pentels have HB lead, but the lead is more delicate than Super Hi-Polymer/Ain. Maybe they assume you'll replace it with Super Hi-Polymer. I found that Amazon.com has a nice selection of Kerry's in several of the different available colors and lead widths for a decent price (~$15). And if you buy 2 that are actually sold and shipped from Amazon itself you will qualify for free shipping as well. No brown ones though. Probably gotta hit eBay for one of them. I've picked up a few Pentels recently, P205, Techniclic, A315 and the included complimentary pack of 12x leads is the standard "Hi-Polymer", not "Super Hi-Polymer/Ain" leads. I think Dave did a comparison of them at some stage and found that they were pretty much identical, except for strength. That said, "Hi-Polymer" is still better than Staedtler leads - they're very fragile! All of those names like "Hi-Polymer", "Super Hi-Polymer", "Premium Hi-Polymer" and "Ain" are rather amibiguous. Personally, I think those are just Pentel's own interchangeable marketing names (for leads, erasers, etc.) used to promote the very same quality product in different world markets. I purchased a blue Kerry .5mm today on this recommendation. It's cap and handsome looks sold me for an everyday pocket pencil. I will go back and get the P205 for my desk. Thanks!! Just got a bronze/brown Kerry from cultpens.com. It has the old "5" logo instead of Kerry, below the clip. Thanks a lot for that info!!! I can't believe that they would have a Kerry still for sale of that vintage and in my favorite color too! I just placed my order with Cultpens for one. I'm looking forward to getting it! I just happened to find this thread while looking up something and find it interesting. I bought one in late 1980 or early 1981 and it only has Pental in it. It is either bronze or brown. After all these years it still sits in the pencil cup on my desk. Only pencils I've owned longer are some dual Autopoints. The cap on mine is still tight but the pencil shows the wear and tear as the finish is places has worn off and the little cap covering the eraser has been crushed on the end a bit. Never a problem with the feed. A few years ago I wanted another as I thought I had lost mine (it was left in my sit coat inner pocket) and hit a local Pental dealer in Toronto who told me they were not in production any longer and did not remember it from my description. Thanks for the lead, guess I'll be ordering a couple of more for backups. I too just stumbled upon this site and found it absolutely great! I had no idea that there were other pencil junkies out there like me! I'm switching gears and careers so I have gone back to college for a history degree and find myself writing all the time and will ONLY write with mechanical pencils. I'm a huge Pentel fan anyway but I just bought my first Kerry today from Amazon.com (they have all colors available) for only 17.00 so I'm excited and cant wait to try it out! Ok, well I'll look forward to hearing of Keli's Kerry adventures. Good luck! Its just aesthetics as far as I know. Having lost so many p205s over the years, I'm reluctant to admit to myself how much i like this pencil. Until I tried a kerry (due entirely to this site) I didn't really get the idea of a "writing" pencil. After all, I "wrote" for 35 years with a P205. I get it now. It's a pleasure to hold, and it's nice not poking holes in my shirts. I'm trying not to lose it--too expensive for that. Thanks Arthur - always good to hear from a satisfied reader. Louis - yes. A review is in the pipeline. I see there is even a purple 505shA available and, unlike the Kerry, ALL the TomBow body parts appear to be metal - anodized aliminum (my one past criticism of the Kerry is too plastic). I have a really nice rollerball from Retro Pens in the same materials and finishes with a very similar pocket clip so now I want this TomBow to complete a set. Not sure, but it looks like the cap is securely retained mechanically with that raised ring on both ends. That is one of the features of the Kerry I REALLY like so, even without ever trying one, I pre-emtively give it several stars. But I too can't wait to read the upcoming review. I'm especially interested in eraser access as I tend to use the built in ones when I don't have my Mars-Staedtler white plastic one handy. Hopefully it does not require unscrewing something like the OHTO Tache does (another pencil on my wish list and thankfully a bit more affordable - $30 for this TomBow is a bit steep but I would say well worth it). I looked at the pics again and, though I may be wrong, it would appear the entire rear body section of the 505shA has to be unscrewed to get to the eraser. Pentel was so much smarter/creative/inspired putting the spring loaded eraser assembly in the cap so that it still works like any other lead advance button with the eraser right underneath. That is a design detail that is very hard to beat and I think I would go nuts having to unscrew the entire TomBow Body everytime I needed the eraser. Funny thing is that the pen I have that would match the TomBow also has a screw on cap, and that drives me nuts too, so I never use it, and chances are the TomBow would end up similarly idle. I never use the eraser that's on the pencils, I think they are just too tiny to be of any use. I've had this pencil for a few months now. I used to use one of those disposable Bic pencils and lead would break at least a few times a day. With the Kerry it has not broken once in the last few months. Kind of dissapointed in the Kerry. It is quite slippery because of the finish. I would much prefer a matte finish that allow for better grip. Other than that, it is perfect. My personal list of improvements to make the ultimate kerry, referbly as a limited edtion item availble to us Pencil Nerd andCollector types, would to have the two non-metal body parts also made of color matched metal just like the cap, maybe with a slightly matte or textured finish in key areas for better grip and also to have all the metal parts like the pocket clip, eraser cap and central union section to have the same matte/textured finish as the tip section. If Pentel made one like that, preferably in a vibrant purple, I would pay whatever they were asking! Hi Greg - well I imagine there might be a few takers, myself included, for a such a Kerry. I must appologize to all for my very bad editing in my last comment/post. I hope all made sense of it. If not: referably = preferably, edtion=edition and add an space before Collector (not to mention the big arse run-on sentence with far too few commas). Yet one more thing I hate about AOL's all-in-one communicator (ver. 9.5 but not at all new to that version) is it negates the in place real time spell checking in these little text boxes. Very frustrating and I am not always motivated enough to compose elsewhere first. So it goes! Just found your fabulous site. I was looking to buy a new pencil as I lost the top of my Lamy I have had for a few years. It was always a bit thin for me to hold. I was considering the Lamy 2000 after reading that review but I am now swayed towards the Kerry as it has a cap (it is also half the price. US$=£ in UK for pencils, a bit like software!). Currently I press down the lead advancement button and hold this down as I press the lead back in to the pencil prior to putting it in my shirt pocked. I presume this must damage the lead. Shame about the rubber being small on the Kerry. I am also a left hander and push pencils and pens across the paper (I hate roll balls and I required the top of the Parker range of fountain pens to stop me from damaging the nib). This makes a major difference to the smoothness and feel of writing compared to a right handed person who pulls the pen and hence there is less friction. I have two questions, between the Lamy 2000 and the Kerry which would be your favoured for every day writing. Also I have used 0.5 leads and found they snap a lot and I am considering 0.7 but afraid this will effect the readability of the words. I have to admit I used cheap non branded leads and never realised the difference until finding your site. 1 = Lamy 200 for me, but if I carried it in my pocket a lot then I would seriously consifer Kerry. 2 = Retracting the lead before putting in your pocket should not damage it in any way. There can be a big difference in lead strength between generic and premium lead, e.g. Pentel Ain or Super Hi-Polymer. Lamy 2000 0.5mm probably won't work for you, but 0.7mm might...but I'd be cautious. Try a cheapo 0.7mm pencil and see how it goes re readability. Anonymous, which Lamy did you have? Some people seem to find the Kerry too thin, and I find the Lamy 2000 too slim in the grip area. Because the 2000 narrows as it gets closer to the tip, my fingers "think" they're slipping down it, so I grip too hard. In other words, I haven't found it the most comfortable pencil I have for long-term use, even if it's the best looking and best made. The Lamy Pencil I have looks like a ST (Model 145). Mine has what looks like black lines going down the shaft of the pencil. Measuring it with a ruler it seems to be about 8mm in diameter. Keith - good to hear you are happy with your "investment". Purchased a blue Kerry yesterday at a stationery store. Im a Project Manager and use a pencil alot in many meetings per day. Im so tired of breaking lead and junk pencils, that I decided to spend some money on a new Kerry. I took this home and all I can say is WOW. This is an extremely nice pencil and I look forward to using it daily. I have no regrets purchasing this quality pencil. Thanks Pentel for a high quality product at a fair price. Has anyone noticed another capped Pentel model, the Pentel Diary Pencil QS55? See Cult Pens, http://www.cultpens.com/acatalog/Pentel-Diary-Pencil-QS55.html "118mm long and just 6.8mm in diameter ... All-metal design" (aluminium barrel, chromed steel and brass fittings). I saw all these comments about the Sharp Kerry and I had to order a blue one from Amazon with Amazon Prime it'll be here tomorrow. I've been using an old Sanford pencil that I found next to my car in one of my college's parking lots about 15 years ago. The printing (silk screening?) has worn where it was cradled in the thumb/forefinger junction and I can't read it. It is black with a stainless steel, finely crosshatched grip area. It has a really good eraser that is advanced by turning the part of the eraser shaft that extends beyond the top of the pen. This same shaft is pulled out to add more lead. It also has a very good clip that is easy to clip to a pocket or pocket protector and it has never gotten loose or sprung after a decade and a half of continuous use. I use it mostly at home since I don't use a pocket protector these days. It is really a drafting pencil, I guess, because it has a window that can indicate the lead type from 2B up to 4H. Sorry to go on and on about it but I really am attached to this pen. I am, however, looking forward to my new blue Sharp Kerry though. At least I'll be able to carry it in my pocket without my wife complaining that I'm ruining my shirts. Thanks for your wonderfully informative and entertaining site and I'll post my thoughts on the new pen vs the old one after I've had a chance to use it for awhile. P.S. If anyone has any thoughts about how to find out what model my old Sanford was please post them here. Thanks. I want a Grey Kerry I have every color except Brown Red and Grey plus I don't have the .7mm ones. IF you goto Shoplet you can get them for 10.00 a piece with free shipping only black though. I just came across this blog by complete accident. Never realised that mechanical pencils were a collectors item. Anyway, loved the review of this Sharp Kerry so much, I just had to buy one for myself! Had to search all over eBay for this as it is not sold in Australia. Perhaps I might start my own collection of pens/pencils. I've owned over 60 different types of mechanical pencils, I've never had one last longer than 2 months (I'm a math teacher and use pencils daily). If this one lasts a year, I'll be surprised and will give one to each of my students (testing the 0.7mm blue now). In your situation I'd only trust a full metal pencil. Several months ago, I was looking for a new mechanical pencil. I had been through many different types and I'd finally found a favorite in the Pentel P205 - a superb, well-balanced pencil - but it was time to try something different. I learned of the Kerry through Dave's "Top 10 General Mechanical Pencils" - I read the review and decided to order one through JetPens in a cool olive green. I was a little hesitant at first with the two piece design as I had never had a pencil with a cap before, however, this has quickly become my favorite pencil. I absolutely love it! It has a nice balance and a sophistication to it that I just don't seem to find in other pencils. I only wish they made it in a .3 mm or .4 mm version. I sish the Sharp Kerry had a sliding sleeve design. A sliding sleeve continually adjusts the support for the lead as you write - greatly reducing lead breakage and providing a more consistent feel. The value of a sliding sleeve is especially evident with soft leads. The combination of fast wear rate and ease of breakage on a 2B, for example, makes the sliding sleeve seem essential to me. Fixed sleeves are great for drawing lines against templates and other guides. Other then that, and being cheaper to make, do they have any other advantage? Aren't sliding sleeves likely to have more slop in them? I have not found any noticeable side play, or "slop" when writing. And I think there is little wear over time since the forces are relatively small and the movements slow. Compared with a fixed sleeve, I suspect they may also be less vulnerable to damage. Is this comfrotable to write with for a long time? I have to write essays in minutes at times, and a pentel 205 just is painful. How about this pencil? Or a DRgrip? I don't have a Kerry. Most comfortable pencils I've used are low-end, disregarded, but excellent Pilot SuperGrip, and an old and no-longer-made, ultra-cheap Zebra. Also like Zebra Drafix, old-type PaperMate PhD and Pentel Technica-X. The last is a "vanishing point" pencil, but as written elsewhere on Dave's blog, I think the eraser system is dangerous because you could stab yourself in the eye with the lead+tube. I finally picked up a Kerry. I was always sort of baffled as to why people liked them so much. Now that I've used it, I understand. It just feels right. I may actually start using it as a "field" pencil for my toolbox. Sort of an odd application for such a pretty pencil, but it strikes me as more durable than any of the others I have used (my Bics keep getting squished). Parts interchagabilty: Always a very good thing. Especially when you have that one absolute favorite pencil you've used for years and years, longer than you can even remember, and one part finally fails/breaks. It's one of the many things I really like about Pentels and what I used to like about my long since discontinued 80's college year's favorite, the Staedtler Micros. The Micro is very different than the MarsMicro. Though both carry the numerical designation of 775, the Micro is somewhat similar to (though in no way the same as) a Pentel P205 whereas the MarsMicro is a very different beast with an odd/gimicky retractable tip and a larger diameter body. Here are some awesome exemplar images of each from Gunther's German Pencil Blog/Collection. From the mid 80's (my college years) I have an original Blue Micro 775 05 (just like in the image but very much tread upon) as well as several others of similar vintage and/or a bit newer, all in factory new conditon I bought from Germ a couple years ago. I also have a MarsMicro just like the other one pictured above. I don't much like the MarsMicro. I only bought it because it was all that I could find locally in the late 90's when the old Micro's were no more. In fact, I used/cared about it so little that I didn't even discover that the tip retracted until a few years ago. Meaning: If you can get your hands on an old Micro, I'm sure you will like it. And sorry, but none of mine are for sale, as they remain in my permanent collection and were aso very hard to come by. But I know a guy. Can the Sharp Kerry be disassembled? On all of my other Pentel pencils, you can pull the lead-holding tube out of the pencil. I'm not sure if you can do the same with this pencil, and the pencil was so expensive that I don't really want to just try yanking on the tube. It all comes apart except for the all matal lead tube and lead advance mechanism itself which is permanently pressed and then crimped together. The tough part is the first time you unscrew the metal tip assembly off as they can be very tight from the factory. You may need to use some sort of rubber to get a better grip but don't use anything meatl or sharp. And once removed the mechanism should pull right out of the 5 piece metal & plastic body assembly. The two plastic body parts also unscrew from each end of the metal centerpiece and that also frees two special little meatal snap that mecahnically retain the cap assembly on each end. My last post was sheer crap! Very poorly proofed and edited! Lots of poor grammer, over-convoluted sentences and far too many typos. If I could retract, re-edit and re-post, I would. Serves me right for trying to write/post something complicated while I had BOTH Jeopardy and MasterChef paused/buffering on the DVR for far too long already! I have to say, I am very impressed with the all-metal internals of this pencil. Looks like the Sharp Kerry will last me a long time. As Dave said in his review, it's a pity that Pentel made the tip a matte color; it kind of detracts from the overall look of the pencil. Still, a great writing instrument. Darn! I just wrote a great comment on the Kerry guts, the tip's matte finish and my specs for the perfect Kerry. But it got dumped during the verification step. No more time right now to reauthor. Maybe rewrite it later. Synopisis: Awesome guts, all pencil guts should be that good...I love the matte on the tip and wish there was more...My perfect Kerry would be matte on all of the now chromed metals and have all 3 body parts anodized metal rather than just the cap. I personally feel that the matte finish makes it look a bit too much like plastic. Perhaps Pentel should make 2 "pencil geek" versions: one with all chrome and one with all matte. I definitely agree with you that the Kerry would be even better if all 3 body parts were metal. You can buy "5" pentel kerry's on ebay for 34 plus 5 dollar shipping straight from Japan. Looks higher quality than the 1971 since kerry's. For the Pentel Kerry collectors. Pentel has released limited edition 40th anniversary colours. Violet, sky blue and gold. They are the new style 'Kerry since 1971' unfortunately. The violet is a beauty. Picked up violet and blue today. I am not keen on the gold but will probably end up buying it. Well, I just bought 3 f the Kerrys off eBay for $45. I'm getting a blue, red and, black .5mm. I figure if mine is from 1980-1981 and has had no problems whatso ever with the pencil it was time to add to the bucket since I've been slowly adding pens to my inventory and been giving pens and pencils away. The Kerrys will not be going anywhere other than possibly giving my son his pick of the lot. So, soon, I'll have 4 in the bucket. Hope the quality i as good as my old buddy's. Got the order and 1of the pencils was .7mmm but, I can live with that as I have few .7s and a good numberof .5s. I Canada sadly, the eraser is noy available per Pentel Canada and the company only shows 1 business possibly having any Kerrys as is the only shop that is buying them. I got 4 tubes of erasers off eBay so should be ood; 1 tube per Kerry. Pentel Canada told me to cut down the ZS2 eraser. You'd think they'd at least support the pencil better. We iscribed the blue .5mm and gave it to junior. The red matches exactly with the red shade of mt Scheaffer 100 red pen/pencil/fountain pen so, I added it to the set. The black .7mm and my old gold .5mm are now in the bucket for daily service. I was quite surprised and happy to find the quality of the new ones are so close to the 30+ year old 1 that I wonder if Pentel is making much on them. I use a Kerry at work and love it.. but sometimes when the lead breaks off, it jams in the tip of the pencil and I have to try and use another piece of lead (very carefully trying not to break it) to push it out. My boss also has a Kerry that he has had for 15+ years and when you remove the cap, there is a poking tool specifically for this function! Does anyone know if I can get this poking tool anywhere separately or find a new Kerry that has one?? You can steal one metal of the point clearing pins from the eraser of some other lead pencil (of same lead diameter) and just insert it into the back of the kerry eraser. The pin just cant be too long. You can also make your own pin from the point end of old broken sewing needle (or jusy break one as needed), if you can find one thr right diameter. You push the pointed end into the eraser and you may have to file the non pointy end to make sure its nice and flat and has no burrs. Just ordered one based on your recommendation--thanks! I think the front tip is matt so when used under a desk lamp you do not get a reflection from the lamp globe. After 3 years the metal point (lead tube)of the pencil wore down by half. The cap got a bit sloppy (i played with it) otherwise it was flawless to use. It looked at home at any meeting I went to. Finally lost it so will buy another, more like two, one spare. I haven't had the lead break yet. I've always been a fan of rubbery grips, but the Kerry grip feels great in the hand just smooth and hard. I write lidless so that the clip doesn't rub me further down my index finger. With less on/off, the lid should snap down tightly for a long time. I like my Kerry very much. However, every now and then, a lead breaks inside, and it's hard to clear the pieces. Long ago I had a mechanical pencil with a lead clearing needle on the other end of the eraser, so I decided to add one to my Kerry. In our sewing box I found an 0.5 mm pin. I pushed it into the eraser with pliers, cut it off with diagonal cutters (leaving 7 mm exposed), and smoothed the sharp corners off with emery cloth. Works well and will always be available. I'm hoping this doesn't sound cheap or anything like that. What sort of prices are people paying for their Kerry's? I used a friend of mines the recently and now I'm hooked, I'm just not sure what is a reasonable price. I'm new to this whole 'expensive' pencil thing. Also, if anyone knows where these are available in Australia, that information would be much appreciated. The Matte finish on the writing tip of the Pentel Kerry pencil is to reduce reflected glare from desklamps, sunlight, and other bright light sources. This type of glare can cause substantial eye strain while writing and drawing, as the center of user's eye is often focused near the tip of the pen during use. It was actually a long considered design aspect of the pencil. Chrome tips were tested before production with negative results. Black tips did not suit the design elements of the pencil. The chrome gnarled midsection of the pencil serves as both cap anchor for each end, as well as a grip for extracting and replacing the cap with slippage from the fingers. The Pentel Sharp Kerry has now slipped down to the low end of the middle tier, and upper end of low tier, in terms of affordability. You can often pick these up brand new off eBay for about $13. It's a really great buy. I have the older Pentel 5. I'm not sure how much different it is from the Sharp Kerry, other than the obvious surface treatment to the metal tip (Kerry has a satin finish, while the 5 has a brushed finish). The Pentel 5 has very lightweight plastic body components. What gives it heft is the rather solid brass core grid patterned middle section. Lead advance is conservative and quiet (no loud clicks). I owned an olive green sharp Kerry for about a year. The pencil sadly got taken from my desk and was never returned. I really liked it but I only had one problem. The metal and resin body was not very durable. I dropped the Kerry once on a concrete floor and there was a huge, ugly dent in the side. Otherwise, The Kerry has been the best pencil I have ever owned. By the way, nice post Dave. I ordered one of these recently, and like it so far. One quibble, though, the grip area and tip don't quite match. The pencil body is slightly larger than the tip. This is probably fairly common among mechanical pencils, but I find it an annoyance (though a minor one.) I'm curious to hear if this is typical for the model, or if it's just mine. Has anyone else noticed, and does it matter to you?